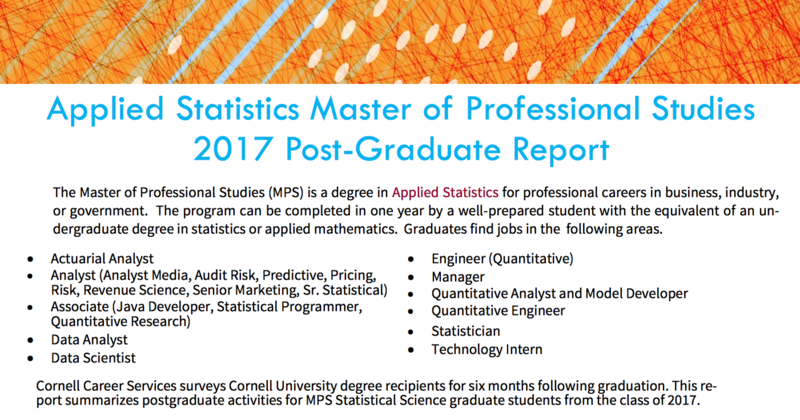 The Statistics MPS 2017 post-graduate report is out! Through this survey, we learn about how well our MPS graduates did in finding jobs after graduating. For prospective students, it's a quick look at how a master's degree in statistics from Cornell can help land positions in industry. • 52 percent landed their jobs through an online job posting (without on-campus interviews); 30 percent obtained employment through a referral, personal contact and/or networking.